Sanding a lawn is a landscape process known as topdressing. 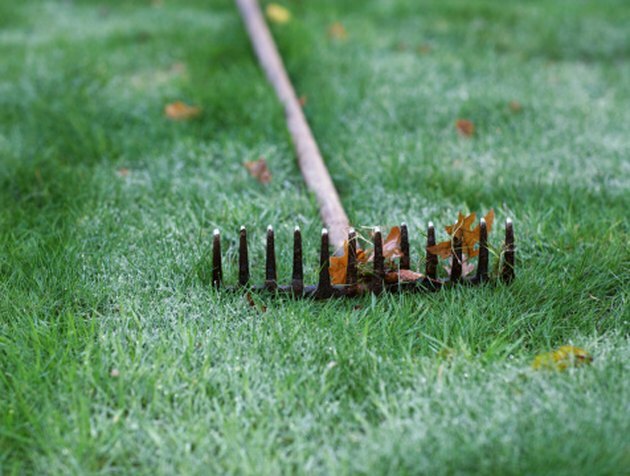 The purpose of topdressing a lawn is to remove large divots and level out uneven spots. This leveling process helps prevent water from pooling in a lawn. Centipede grass propagates quickly by spreading out from its original growth, hence its name. Because centipede grass is not a highly drought-tolerant grass, homeowners tend to water the grass frequently. This excessive watering can lead to water ponds in the lawn, resulting in the need to topdress it with sand. Pour sand in any areas near divots or uneven portions of the lawn. Rake the sand into the uneven areas. Do not make the sand layer more than 1 inch deep. Sweep the lawn with a broom. This helps move sand off the level areas of the lawn. Excess sand can kill healthy centipede grass.